Pro Lures Online Now Open! Pro Lures Online is America's 1 choice for top of the line,tournament grade,American made custom lures and is now open for business. At Pro Lures Online they pride themselves in offering high quality tournament grade fishing lures. Their vision is to be the first choice of anglers when they realize the need for outstanding Spinnerbaits, Jigs, Buzzbaits, Crankbaits and other top of the line fishing supplies. They not only use what they build and sell, they have confidence in it! Their Mission is to Provide customers with the finest lures possible and to build a lure exactly to your own specifications. They carry many hard-to-find items from only the best vendors located throughout the United States, simply not available elsewhere. Tournament anglers will love their selection of top of the line products. Add to this their commitment to customer satisfaction and our 100% guarantee and you have a winning combination that's hard to beat. 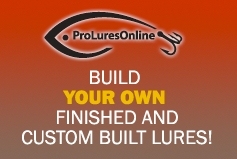 They invite you to browse through their site and see their line up of quality lures for yourself.